It doesn't take algebra to find the formula for a conscious-altering state: s(b) x s(t) + z(r) x z(b) + y(s) x y(b) = A. The moral of this story, "Beware the ids that march," pretty much tells you everything you need to know about Return to the Forbidden Planet. It's stupid fun, it's irreverent relevance, it's Shakespearean silliness. Other than spending two hours laughing, though, is there any redeeming value to this production at the American Shakespeare Center's Blackfriars Playhouse? How about outstanding musical talent, spot-on comic acting, stagecraft par excellence, and some pretty good dancing, too? 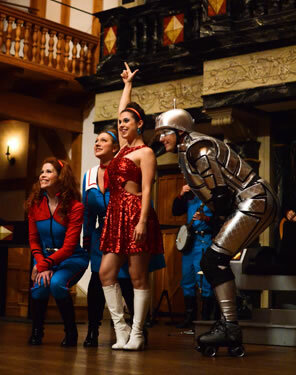 "Oh, Pretty Woman": Miranda (Emily Brown, center) tries to impress Captain Tempest as, from left, Gloria (Lee Fitzpatrick), Petty Officer Anne Arkey (Allison Glenzer), and Ariel (John Harrell) sing along in the Blackfriars Playhouse production of Return to the Forbidden Planet. Photo by Pat Jarrett, American Shakespeare Center. Return to the Forbidden Planet has its genesis not so much in William Shakespeare's The Tempest but in Forbidden Planet, the 1956 science fiction film based on The Tempest. Bob Carlton took the premise of that movie, gave it a Star Trek vibe, infused some '60s counter-culture attitude, injected it with Shakespearean steroids, and wrapped it all in rock and roll. How Carlton cleverly fuses Shakespeare, science fiction, and pop hits into a seamless tale is the show's genius. An asteroid attack becomes "Great Balls of Fire," Ariel the robot feels "Good Vibrations," Doctor Prospero's wife who banished him many years ago is "G-L-O-R-I-A," and when Prospero must "this rough magic…abjure" and leave the planet, he better "Go Now!" The characters generally speak either pure Shakespearean lines or contextually altered forms of Shakespeare's verse from 16 plays and two sonnets (plus a little Marlow). "What planet, friends, is this?" Captain Tempest asks after their (fittingly named) Intergalactic Starship Albatross crashes. "It is D'Illyria," a member of the crew says. "And what should I do on D'Illyria?" You can spend the production playing "spot the play" (we detected Twelfth Night, Julius Caesar, Hamlet, Henry V, Romeo and Juliet, Macbeth, King Lear, A Midsummer Night's Dream, and, of course, The Tempest). You can play "spot the Star Trek references," too, such as cast members pushing lots of buttons, the crew physically reacting to the asteroid strikes on the ship, and monitors that show life forms as beeps: "Two beeps, or not two beeps?" That is the question in the play's plot, as Doctor Prospero's magic is the making of a conscious-altering drug. Such a drug has the capacity to create a monster with giant tentacles slithering up through the stage trap door and descending from the ceiling. We've attended 67 plays at the Blackfriars, the world's only authentic replica of Shakespeare's indoor theater, and this is the first time we've seen "the heavens" used there—not for Jupiter descending on an eagle in Cymbeline, not for Ariel as a harpy in The Tempest, but for a giant polka-dot tentacle writhing to the tune of "Monster Mash." True to its Shakespeare-era purposes, the Blackfriars seldom features sets, but for Return to the Forbidden Planet, the stage has been transformed into the Enterprise-like bridge of the Albatross, complete with a centerpiece captain's chair that Kirk would recognize as his. The tapestry curtain normally at the back of the stage is replaced by glittering blue and silver strands that you might expect a Charlie's Angel to step through. Otherwise, the captain's chair and the rest of the bridge's equipment feature in colors and motif the design elements of the playhouse. The costumes by Erin M. West, however, are pure sci-fi kitsch. The crew's uniforms are styled like something a wait staff might wear at a New York dinette, aqua blue with red and black trim and laser gun belt buckles. Doctor Prospero, goggles perched on his forehead, wears a long, shiny white coat straight out of a Rick James video, and Ariel (played with impish innocence by John Harrell) is all silver padding with black knee and elbow pads, wrist braces, and a helmet with a spring doorstop stuck on top as an antenna. Roller skates are his mode of movement. Incongruously integrated into the set are musical instruments. The console operated by Petty Officer Anne Arkey is actually a xylophone played by Allison Glenzer. The Navigation Officer's console serves as a holder for clarinets and a trumpet, and a stand-up drum kit stands next to it. Beside the captain's chair is a vertical contraption of brass piping, otherwise known as a trombone. Piano, cello, and timpani are up in the balcony. Cast members not only sing the tunes, but play them, too. That's the singularity that the Blackfriars' aesthetic brings to Return to the Forbidden Planet. This playhouse uses no electronics or digital life forms in its productions, so all the music is presented live and acoustically. To represent the Albatross blasting off on its flight, the entire crew breaks into "Wipe Out" with Chris Johnston as Lt. Hotlix McShredalot playing the song's lead electric guitar part on his banjo. That's being truly unplugged. And when Dylan Paul as Captain Tempest picks up his trombone and weighs in on the song along with the rest of the cast, a pulse couses through the audience, an awareness that we are in for a rollicking good trip. 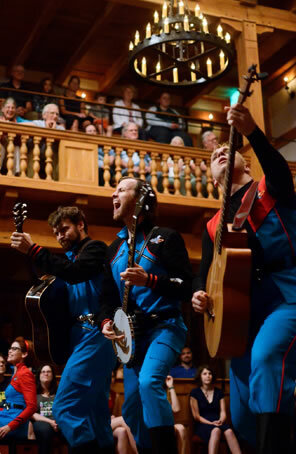 Blasting off, from left, are Josh Innerst on guitar, Chris Johnston on banjo, and Benjamin Curns on bass. Photo by Pat Jarrett, American Shakespeare Center. The fact is, Johnston, who serves as the production's music director, could play the entire orchestral score of Beethoven's Seventh Symphony on his banjo, so versatile is he with the instrument, but he also takes turns on the piano, drums, bass guitar, and rhythm guitar. Yet, he's just one of many multitalented performers in this cast that moves around to fill in on each other's instruments according to the play's action. You could spend the production playing the game "who's playing what on this song?" Gregory Jon Phelps as Cookie lays down many a mean backbeat on the drum kit and blows a ripping sax solo on "She's Not There." Tim Sailer as Ensign Jed I. Knight gives his trumpet a workout on "It's a Man's Man's Man's World" among many songs, and fills in on piano, too. Josh Innerst as Little Dickie Triplesticks moves back and forth between guitar and cello, and Benjamin Curns as Bosun Arras provides solid rhythm tracks whether he's playing bass, guitar, or drums. Everybody sings, too—all at least well, some superbly. Director Jim Warren even works the background singing into background activity on the ship. As Cookie and Bosun Arras sing "The Shoop Shoop Song (It's in Her Kiss)," sneak a peak to the back of the stage where Doctor Prospero (René Thornton Jr.) and Captain Tempest are miming earnest conversation; you'll notice they are actually shoop-shooping with the rest of the crew. Everybody dances, as well, mostly choreographed hip-shaking and pony prancing. However, choreographer Stephanie Holladay Earl also puts Captain Tempest and Miranda (Emily Brown) through some complex ballroom dance moves. They may not be dancing with the stars, but their dancing among the stars is pretty good, nonetheless. What's left to discuss is the acting, and for that discussion let me establish a perspective. I am closing in on seeing 300 staged Shakespeare productions, from London to Ashland and every Stratford in between. In this production is a cast that includes actors who are among the best Richard Gloucesters and Iagos (Curns), Brutuses and Benedicks (Thornton), Hamlets and Clotens (Harrell), Mercutios and Henry Vs (Phelps), and Lorenzos and Arragons (Johnston) I've seen over the years, and an actress who is the best Speed and Jailor's Daughter (Glenzer) I'm likely to ever see. Their expertise with Shakespeare's verse is A+ and their respect for Shakespeare is from the heart; they approach their roles in this farce with the full measure of their skills and regard in play. That just makes it so much funnier. Meanwhile, two newcomers to the company turn in all-galactic performances. Paul as Captain Tempest nails the verse, projects cockiness, sings superbly, and exudes sexiness; Brown as Miranda sails smoothly through the verse, projects childlike charm, sings superbly, and exudes sexiness. It doesn't take algebra to find the formula for a conscious-altering state: s(b) x s(t) + z(r) x z(b) + y(s) x y(b) = A. Spelling it out, the formula is Shakespeare times Star Trek plus rock and roll times the Blackfriars Playhouse plus top-tier Shakespearean actors times superb musicians equals a Return to the Forbidden Planet that is without a doubt one of the most memorable trips you will ever take.